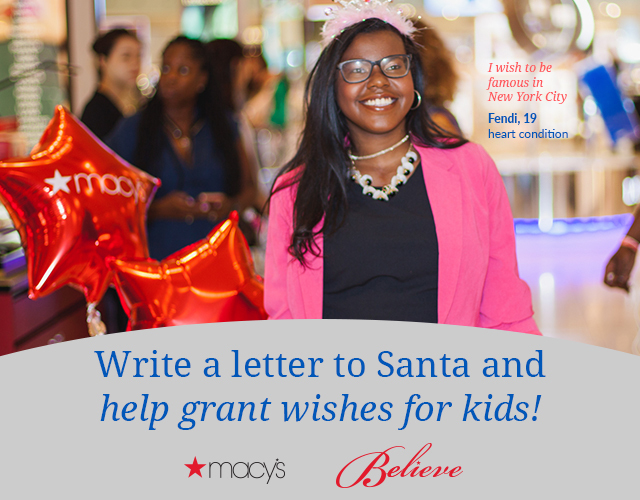 For every letter sent, Macy’s will donate $1 to Make-A-Wish to help grant more wishes. For more information about Make-A-Wish America, visit wish.org. To transform the lives of children with critical illnesses, please make a donation. Please add Make-A-WishFoundation@newsletter.wish.org to your address book to ensure future delivery. © 2018 Make-A-Wish Foundation® of America. Make-A-Wish Foundation, Make-A-Wish and the Make-A-Wish swirl-and-star logo are marks of Make-A-Wish Foundation of America. All other marks are the property of their respective owners.